Many Lewisville people could improve their smile with braces, yet only a portion are currently undergoing treatment. A common reason Lewisville people delay or forego orthodontic treatment is because they believe it is a difficult, expensive process requiring traditional metal braces. 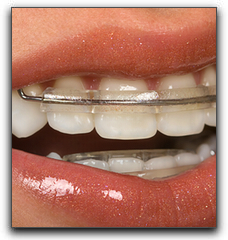 Spring retainers are removable, less noticeable, and less expensive than conventional braces. Unlike traditional retainers which are designed to maintain alignment and prevent further shifting, spring retainers can move teeth 1-2 mm in the desired direction. They are often recommended for Lewisville people who neglected to wear their retainer after undergoing orthodontic treatment. At The Lewisville Dentist, we have a variety of orthodontic options available. If you would like to straighten your teeth, call us at (720) 306-8057 to schedule an orthodontic consultation. We also offer the full spectrum of cosmetic dental procedures including teeth whitening, porcelain veneers, crowns and bridges, and cosmetic bonding. Ask us about pediatric dentistry, sports dentistry, and oral cancer screening.